Forced off to school in a frilly pink dress, Bill discovers one of the worst days in his life is about to begin. Baffled by the way things are just different for girls, Bill falls headlong into trouble. As the amazing day drags on, Bill's new frock becomes dirtier and tattier. How will it all end for him - or her? Anne Fine answers some of the questions she is frequently asked about this popular and much-read book. 1. How did you get the idea for the story? Then we came back to Britain. My children came home from their new school astonished at how often the boys did one thing, but the girls did another. And there were other things they noticed: boys were always given the noisy instruments in the Music class; girls were not expected to read adventure books - that sort of thing. My daughters were also shocked by how the teachers seemed to expect different standards of neatness, quietness and behaviour, depending on whether you were male or female. So I spent six months researching what was really going on in schools. And in the end I thought this story would be the quickest way of reminding teachers not to be sexist (often without realizing), and also the funniest way to teach children to recognize the many, many way in which it can happen. 2. What is the main theme of the story? The theme is what we call "gender inequality". I hope my readers will think about the dozens of things that irritate Bill about his day as a girl (for example, being hampered by having no pockets, or having his understandable and justified anger about the fight with Rohan being made light of as Bill just being 'upset'). As readers come to see how frustrating it is for poor Bill to be treated this way, I'd like them to think about whether it's fair or right that girls should get this sort of treatment either - some pretty well every day! 3. Did you base any of the characters on real people? Yes and no. I had no particular boy in mind. But I wanted Bill Simpson to be just the sort of normal, friendly and average boy I've met in hundreds of different classes in hundreds of different schools. Look round you! He's in your class too! 4. Do you think boys are actually treated differently from girls at school? Far, far less than they used to be. (In my old primary school, the girls were led off to sewing while the boys learned woodwork whereas everyone now knows that boys and girls all need to be able to sew on a button and handle tools safely and well.) But out there in the world there's a huge amount of pressure on girls to care about what they look like, and be 'girly'. And on boys to be tough, and mad on sport, and not show their feelings so much. So it's really important that there's none of this pressure inside schools. Left to themselves, girls come in all sorts. So do boys. And if there are differences between them they're far less important than all the many, many things that girls and boys have in common. 5. Are you going to write any more stories about Bill Simpson? 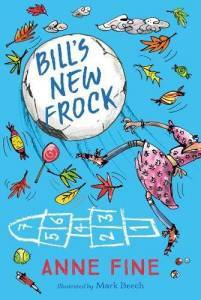 Anne Fine answered these questions for Scholastic Books, who have published a book for of suggested activities based on Bill's New Frock called Read and Respond: Bills New Frock , by Gillian Howell, and a related digital teaching aid, Read and Respond Interactive . Read more about Bill's New Frock , or about how Anne Fine's books are used in schools.